This page includes previous Joining With Juniors columns from the 1996 issues of Across the Fence Post . Happy New Year!! As the 1996 stamp-collecting year gets under way, it is time for the youth leader to plan activities for another year of philatelic phun. Whether you meet weekly, biweekly, or monthly, it is important to plan ahead. If you share the responsibilities of leadership with another person(s), establish a time when you can get together as a team to discuss and plan the year. You might want to start by brainstorming lists of possible program ideas. One list might be the names and topics of resource people available from your own club. Don't forget to include your local dealers and post office personnel as a resource. Another might be a listing of themes associated with a particular month or season of the year. Calendars and library references will cue you into celebrations such as Black Heritage Month, Famous American Month, etc. Also make a list of philatelic basics that you want to introduce and/or review. If you plan on using any audio-visual aids, plug those into your planning calendar and write away to re-serve the specific titles. Program ideas may also be related to the new issues that will be released during the upcoming year. Use one of the philatelic weekly newspapers to provide you with a listing of the 1995 United States stamp program. If you have been following my column during the past year, you will recall that I have offered a variety of program ideas and activities that relate to newly issued commemoratives and definitives. I plan to continue the series. In October 1994, I wrote about the popular children’s "Reading Rainbow series devoted to learning about the mail and stamp collecting. The program is being shown again and this might be an excellent opportunity for you to tape it for future use with your youth members. Although originally taped for the fall 1994 season, its reruns enjoy an immense following. Each 30-minute program is highlighted by the reading of a children's book followed by several segments related to the book. This following information was taken from the Parade of Programs booklet, which is a teacher guide to 1995-96 instructional television programming. The Wisconsin Educational Communications Board prepared it. "Program #107 - HAIL TO MAIL is scheduled for the week of January 22-26. It probably will air on Tuesday, January 23, 1996. The 30-minute program opens with host LeVar Burton in a setting or location relating to the featured book's theme. After Burton introduces the book, a celebrity narrator reads it aloud. Illustrations from the book support the narration, so students can see as well as hear the story line. Programs also include theme-related book reviews by children, songs, dances and 'kid-or-the-street' interviews." The program will air at 2:30 p.m. on instructional TV. Wisconsin Public Television, stations include WHA-TV/ Madison, WPNE-TV/Green Bay, WHILA-TV/Lacrosse; WHWC-TV/ Monomonie-Eau Claire, WHRM-TV/ Wausau and WLEF-TV/Park Falls. Translators which extend Wisconsin Public Television are located in Burnett County on Channel 39, Grant County on Channel 49, Florence County on Channel 54, Door County and St. Cruix County on Channel 55, and Adams County an Channel 64. Affiliate stations WMVT-TV/Milwaukee and WDSE-TV/Dututh-Superior carry the same instructional schedule. The book, HAIL TO MAIL, was originally written in 1927 by Samuel Marshak, a Russian. The story has been translated by Richard Pevear and illustrated by Vladimir Rudunsky. The story, written in rhyme, tells the tale of a certified letter as it is carried by a succession of mail carriers. From New York to Switzerland, then on to Brazil, the letter is faithfully carried around the globe as it tries to catch up with Mr. John Peck. The stamp collecting segment of the show focuses on Matthew Ross, a 12-year-old Brooklyn stamp collector, a protege of George T. Guzzio. The opening and closing stamp montages feature the philatelic material of Mary nn Owens (former Wisconsinite), Guzzio, and Ross. Other segments include children telling why they write letters and a tour of what happens to the mail dropped in mail boxes at both a Long Island Post Office today contrasted with archival film from Washington, D.C.
Make a resolution to introduce the hobby of stamp collecting to a young person. The Year of the Rat stamp to be issued in February is the fourth in a continuing series begun on December 30, 1992, for the 1993 lunisolar New Year. The first of the series was issued for the Year of the Rooster. Not only was this stamp issued very late in the calendar year, it also had the distinction of being the first non-high value stamp to be issued in panes of 20 rather than the 50 that was standard for commemorative-size stamps. The stamp, issued to incorporate a New Year's theme, was produced to specifically appeal to Asian Americans. It was well received in communities with a large Chinese-American population as well as with overseas buyers. So, it was decided to continue to issue the New Year's stamps. No New Year's stamp was issued in 1993. However, two New Year's stamps were issued in 1994, The first of these was released on February 5, 1944, for the Chinese Year of the Dog, The other commemorated the Year of the Boar and was released on December 30, 1994, It paid the first-class rate of 29 ¢ for a period of only two days as on January 1, 1995, the rate rose to 32 ¢. Non-philatelic uses of this stamp are difficult to find. After sharing background information about the Chinese New Year's stamps, youth might be interested in research to find out more about the different calendars that have been used over the years. 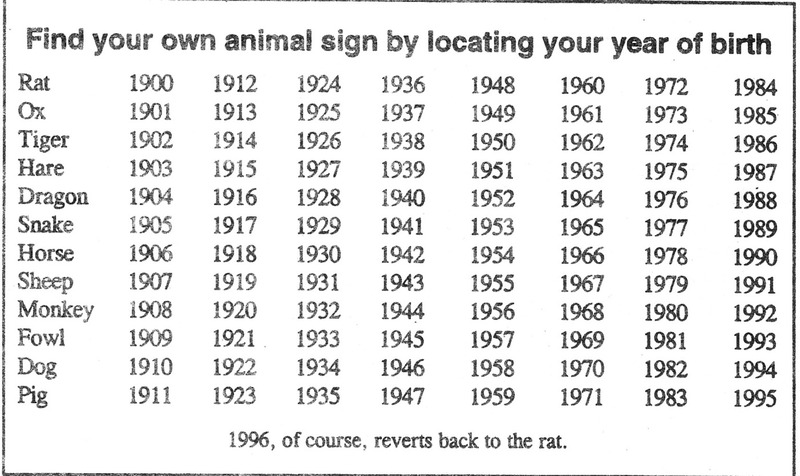 Challenge your members to find out what "year" or sign they were born under. Leaders could prepare a simple poster chart listing the 12 animals in the Chinese zodiac and the years represented by each animal sign. Chinese stamps to give to youth in attendance. As a mini-lesson, you may want to share information with your members as to the distinguishing symbols and characters to differentiate between the stamps from China and the stamps from the Republic of China. Now, as far-fetched as this may seem, it may also be a good time to bring up the terms: philatelist, stamp collector, accumulator, and pack rat. By helping children become aware of the differences in the types of collecting habits, you are also making them more aware of what type of collector they may be and what they can become. Use the idea of a "stamp" pack rat (which unfortunately has bad connotations), as a person who hoards stamps, covers, and miscellaneous philatelic material. Show your youth members the wide variety of proper storage materials for their philatelic collectibles. Share with them the problems that may result from improper storage. Give glassines, mounts, stock cards, etc., as gifts for completing extra project work or research. In November 1992, I did a youth club program similar to that described by MaryAnn. I enlarged the chart shown below so the youngsters could easily identify their individual signs. Fortunately, I had a Asian-American member in the club at the time. His mother accompanied him to the meeting and explained that the cycle of years is frequently used for astrological purposes, much the same way the 12 - signs of the zodiac are used in the West to describe personality traits and to tell fortunes. As each child called out his/her animal sign, the mother read aloud the significance and traits attached to the signs. Interestingly, they were all very positive, even for my sign, the snake! Birds will be issued on several postal emissions during 1996. The 1 ¢ American Kestrel was released in coil format on January 20. It had previously been issued as a sheet stamp in 1995. A Woodpecker is the design of a 2 ¢ sheet stamp released, on February 2. Stamp announcements also foretell the issuance of a 20 ¢ Blue Jay stamp as a self-adhesive coil stamp and later as a pane of 20. In October, four of the 15 Endangered Species stamps to be issued portray birds. They include the thick-billed parrot, brown pelican, California condor, and the piping plover. Add these 1996 issues to the bird stamps that have previously been issued and you will have a "flock" of fun learning about stamps* stamp collecting, and birds. What better time to think about birds than spring! Have each child find and bring to the session a bird stamp. In a show-and-tell fashion, have each member identify and show his or her bird. Display all of the bird stamps. Then take a vote to determine the most beautiful bird stamp. Begin your bird lesson with a discussion of the pigeon post. Relate how pigeons were used to carry the mail during the Franco-Prussian War of 1870-71. Messages were photographically reduced or microfilmed. One pigeon could carry up to 40,000) messages on 12 to 18 films, measuring 38 mm by 60 mm. The films were rolled to a pin's thickness and inserted into goose or crown quills. These quills were attached to pigeons' tail feathers. When the carrier pigeons arrived in Paris, the films were re-moved and the film mounted on glass slides. The messages were projected onto a screen where they were transcribed in longhand and then transmitted by the regular post to their respective addresses. To stimulate practice using the catalog, make up a few riddles that test the bird knowledge of your members. For example: Which birds fly in a "V" formation and honk? When the correct answer (Canadian geese) is given, challenge your youth to find the stamp in a United States postage stamp catalog and give its Scott number. (U.S. Nos. 1757c or 2334). If you are short of catalogs, have children work in pairs. Another interesting stamp challenge making use of bird stamps from around the world and also providing catalog practice was offered in the December 1995 issue of The Stamp Zone a monthly magazine for young stamp collectors. If you would like a copy of the Bird Jumbles puzzle, send a SASE to me at P.O. Box 1451, Waukesha, WI 53187. Ask children if they have ever heard of the term "birdbrain." Explain how birdbrain is a ward sometimes used in reference to a person who is stupid or thoughtless. Either relate from your adult perspective or have the children suggest some of the things that collectors do that show a birdbrain attitude toward their stamps and collections. If time permits, this could culminate in the making of posters such as "Don't be a birdbrain - use tongs to handle your stamps" or "Don't be a birdbrain - soak stamps on colored paper separate from the rest of your stamps. " Other discussion or poster ideas could include proper storage techniques and some of the "don'ts" of the hobby. Every adult collector probably has some horror story related to a stupid mistake they made while working on their collection. The Centennial Olympic Games will be held in Atlanta, GA, this summer. To commemorate the 1996 games, the U.S. Postal Service will issue a pane of 20 stamps in the format of their "Classic Collection" stamps. Each of the colorful action-figure stamps will depict athletes in the performance of 20 Olympic events and will have descriptive text on the reverse of the stamps. There are many activities that you can do with stamps to educate children about the historical background of the Olympics, its sports, and the ethnicity of the participants. Only imagination and resources available limit one. What follows are some suggestions for projects that you might like to try with your group. Need a mini-break from an intense lesson? Get your kids moving with this game of Olympic charades. Give each child a used sports stamp. Have them pantomime the athletic event while the others try to guess. Kids get to keep the stamp. Find out the names of the participating countries. Using a stamp mixture, try to find a stamp issued by that country. How many different countries were you able to find? Even more challenging would be to try to find flag stamps to represent each of the participating nations. Draw the Olympic rings on paper - each ring approximately 2 inches in diameter. Discuss the number of rings in the Olympic flag, the colors used, and why those colors were chosen. Use the paper as a mini-lesson to review hinging techniques. Have your youth find a single stamp to mount within each ring. Depending upon the abilities of your youth, either have them find a single-color stamp closest in color to the ring in which they are hinging the stamp OR have them try to locate a stamp from a different continent to put into each of the rings. Hint: stamp identifiers and maps are useful tools for the latter project. In fact, you may want to "pick" the mixture so that hard-to-identify countries have been eliminated. Create your own philatelic Olympics. A tong relay race can be lots of fun! Divide the group into teams. Have a mixture of stamps at one end of the room. Give each team one pair of tongs. Members must race down to the other end of the room, pick up a stamp with the tongs, race back to the starting line, deposit their stamp in a box, then pass the tongs on to the next person. If a stamp drops, it must be picked up with the tongs. Another variation is to have a pair of tongs for everyone on the team. The first person picks up a stamp with his tongs, passes it on to the next person, and so on until the stamp reaches the end of the line. The last person puts the stamp in a box, runs to the front of the team, and begins the relay all over again. The winning team is the team that has each member back in his or her original positions. In the catalog caper, pairs of students work together to find the answers to questions posed. Questions should be geared to the abilities of your members. Naturally, the questions should center on sports or Olympic stamps. For example: What sport is the subject of a 1980 set of two stamps from Spain? (Soccer). There are many options. The leader can pose the questions one at a time. Questions could be printed on paper. Another option: weigh the questions so they are worth varying points. This article is a combination of "Topic-Comer" and "Joining with Juniors." As you read further, you will understand how one junior collector an article about beavers that appeared in ATFP influenced. It started about two years ago. The major players are all stamp collectors: a Canadian, a youngster from Colorado, and three Wisconsin collectors (Clete Delvaux, my husband Gene, and n. The scene: CAPEX '96. But let's go back for the rest of the story. In March 1994, the ATFP "Topic-Corner" column was written by a guest, Mike Bedard of Canada. Mike was a pen pal and topical collecting friend of Clete Delvaux, former editor of this newsletter. In that first article, Mike chose to share a little about his personal life and then proceeded to write about his love of beavers. In the May-June issue, Mike returned to write an in-depth three-part series about the beaver. The second part appeared in the September 1994 issue, and the last part appeared in the October issue. Perhaps some of you will remember the well-illustrated articles. My nephew, Brian Bowman, a 10-year-old (at that time) stamp collector from Colorado was also a lover of beavers. Brian had been fascinated with beavers ever since he was a toddler. A visit to his bedroom would reveal shelves of beavers, beaver books, beaver memorabilia of all sorts. Brian did not have many beaver stamps - mostly because he did not know what was available. 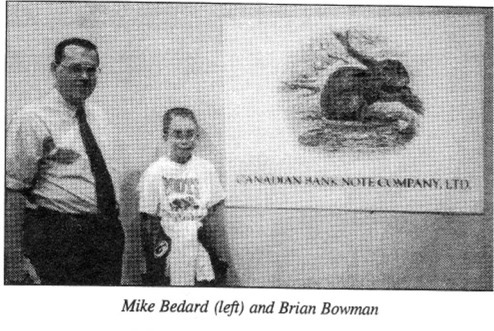 Early in 1995, I sent copies of the beaver articles to nephew Brian and urged him to write to Mike Bedard. About the same time, I also wrote to Mike and told him of Brian's interest in beavers. A correspondence between the two developed. In early 1996, it looked as though Gene and I would be attending CAPEX. We made arrangements for Brian to fly to Wisconsin and then u> drive to Toronto with us. Needless to say, Brian was very eager to meet his pen friend. At their first meeting, Mike had a large packet of beaver materials (philatelic and non-philatelic) for his young friend. He spent one morning accompanying Brian around the exhibit floor, pointing out the postal agencies that had beaver stamps for sale, looking at the Canadian beaver exhibits, and showing Brian the highlights of the show. That evening they met for an enjoyable meal. October 2, 1996, is the issue date for the Endangered Species stamps, 15 se-tenant 32 ¢ commemorative stamps are designed to call attention to the plight of animals in our country that face possible extinction. "Collect and Protect" is the theme for National Stamp Collecting Month, which will officially start with the release of the stamps. School-aged youngsters are very much attuned to the environment and related issues through various programs taught in the schools. Their fascination with animals makes this set of stamps a natural turn-on for kids. Before sharing the sheetlet of stamps with your youth group, have them brainstorm a list of animals (found in the United States) that they think are endangered. Compare their list to the endangered species shown on the stamps. Give each youth a single mint stamp from the sheetlet. Using research materials available, challenge them to design a fact card or sheet about their animal. Information could include the animal classification (birds, reptiles, etc. ), habitat, physical appearance, feeding habits, etc. Include a small North American map and use color to identify the area of our country where the species live. Make a two-column chart. Label one column "Threaten." Label the other column "Protect." Under "Threaten," list the things that reduce the number of animals. Under "Protect," list the things that have helped the endangered species survive. This can be done as a general discussion of endangered animals or it can be made more specific with each youngster filling out a similar chart on the animal for which he or she is doing research. Interested youth may want to take this project further and find stamps for endangered animals from around the world. Similar research could be completed for each animal. It might be fun to combine the research into a group project or even a group exhibit. The work could be shared with an adult stamp club or another class. All of the pages could be combined to produce a group booklet and displayed in the school library. Need a display for a showcase? Combine both stamps and the research done to make a mini-exhibit featuring the endangered species. Animal types or habitats might categorize stamps. Each stamp should be carefully mounted on the pages with a brief write-up using the information gained in the research. The Summer Olympics is history. Many youths enjoyed watching the various events on television, experiencing the moments of success and the frustrating moments of defeat and agony of athletes from around the world in competition. What most people don't realize is that the Olympics are more than an arena for sports figures. Arts and cultural events share the stage during the festivities. One such noteworthy event for the philatelist is OLYMPHILEX, officially known as the World Olympic and Sports Stamps Exhibition. As part of OLYMPHILEX '96, an area for novice and youth collectors was staffed, and activities, literature, and free stamps were given away. The organizing committee prepared a booklet of educational materials on stamps and the Olympic Games. The 40-page booklet contains 10 lessons with reproducible activities. It allows for flexibility of use by both leaders and youth. Teachers and leaders using the booklet can present the lessons and distribute the handout activities. Older youth can use the material much like a workbook. They read through the lesson and then work through the activities independently. The exercises are self-correcting with the answers located in the back of the booklet. Black and white illustrations are found throughout the booklet. Pages contain easy-to-read text. The booklet seems geared to appeal to the 10- to 14-year-old age group. Novice adult collectors would also learn from the series of lessons presented. The educational emphasis of this booklet is very evident. Skills being taught are listed with each lesson. Some lessons have questions and discussion ideas. It should appeal to educators looking to teach reading concepts and comprehension through the fascinating hobby of stamp collecting. If you have been looking for material to use with a budding stamp collector, this might be a good resource. As a mentor, you could go through one lesson each time you meet. The booklet provides opportunity to discuss the concepts being taught as well as activities. The booklet might also be used as a birthday or holiday gift with a packet of stamps. I have often said that the gift of quality time with a young collector will help to ensure the future of the hobby. The holiday season is upon us once again and there is a certain amount of excitement and anticipation in the air. Choose stamp activities that promote the festive atmosphere, allow for creativity and expression of self, as well as providing an outlet for pent-up energies. Writing a letter to Santa may seem childish. Kids of all ages, however, have found that they can get a response as well as a unique philatelic collectible when writing to Santa. Many local post offices working with community organizations provide Santa responses. If you are looking for an international flair and a colorful letter carrying a Finnish stamp and Santa Village postmark, send the letter to: Finland Post, Santa Claus' Main Post Office. FIN-96930 Arctic Circle, Rovaniemi, Finland. A similar response can also be received by writing to Santa Claus at North Pole, Canada HOH OHO. Teaching an appreciation for culture and customs can also be taught through holiday stamps. Find out how to say "Merry Christmas" in a variety of foreign languages. Challenge the youth to find a foreign stamp from the country in which the holiday greeting is expressed. 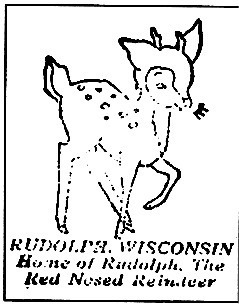 Study the designs of Christmas stamps. Do any show traditions and customs unique to that country or region of the world? Why does Australia have a surfing Santa stamp? Discuss or have the kids make short reports on their findings after research. The United States has introduced many innovations on its Christmas stamps. Prepare a short program of interest on this topic or produce a game or activity based on this information. Do any Christmas stamps remind you of a song title? Find a holiday stamp, hinge it on paper, and write the song title beneath the stamp or on the back of the paper. This activity can conclude with the rest of the collectors guessing the song title and then enjoying a sing-along. Christmas seals fascinate kids. Introduce the term "cinderella." Share and give examples of these colorful seals. Discuss the historical background and evolution of the Christmas seal as a collectible. Reinforce the concept of hinging. Have children cut a large tree shape from green construction paper. Use Christmas stamps chosen from a mixture to hinge as "ornaments" onto the tree. Damaged stamps can become the basis of craft items that are made and given as holiday gifts. Cover cans to make pencil holders. Make bookmarks using stamps that relate to an interest or hobby of the recipient. Design cards or make onaments. The holiday season is a great time to introduce a young person to the hobby of stamp collecting. A packet of stamps can open the door to new avenues of philatelic exploration provided that it is followed with a liberal dose of quality time with the new collector. You can make it happen! Resolve today to introduce the hobby to someone.